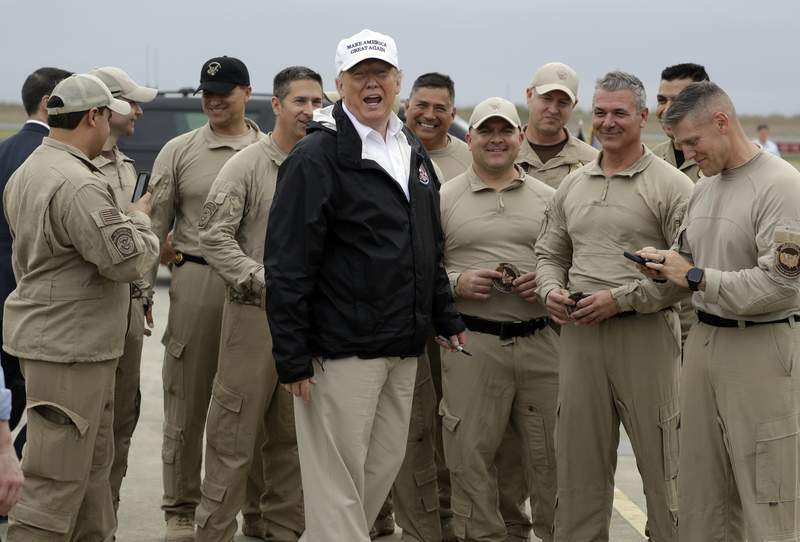 Associated Press President Donald Trump turns as he talks to U.S. Customs and Border Protection officers at McAllen International Airport as he prepares to leave after a visit to the southern border, Thursday, Jan. 10, 2019, in McAllen, Texas. WASHINGTON – The White House has begun laying the groundwork for a declaration of national emergency to build President Donald Trump's border wall, a move certain to set off a firestorm of opposition in Congress and the courts but one that could pave the way for an end to the three-week government shutdown. The preparations are taking place with talks at an impasse over Trump's demands for $5.7 billion to construct more than 200 miles of wall along the U.S.-Mexico border. Democrats are staunchly opposed, leading to a partial government shutdown that Saturday will become the longest in U.S. history. Some 800,000 federal workers are about to miss their first paycheck since the shutdown began Dec. 22. Trump, who walked out of a White House negotiating session Wednesday after House Speaker Nancy Pelosi, D-Calif., refused to agree to pay for his wall, reiterated Thursday that he may well declare a national emergency if Democrats don't give him what he wants. “We can declare a national emergency. We shouldn't have to because this is common sense,” Trump told reporters as he visited the border in Texas, accompanied by the commanding general of the Army Corps of Engineers. Trump repeatedly has said Mexico would pay for the wall. The president and the administration have been depicting a humanitarian and public safety crisis at the border, focusing on drugs flowing into the United States and violence by unauthorized immigrants. Asked about a timetable for a national emergency declaration, the president said he would see how it goes with Congress. But on Capitol Hill there were no signs of progress, and instead lawmakers of both parties were bracing for Trump to declare a national emergency. Democratic staffers from leadership offices and relevant committees met Thursday afternoon to discuss a potential response. The House and Senate could move quickly to pass a bill to reopen the government, predicated on assurances from Trump that he would sign the legislation. But conservative Rep. Mark Meadows, R-N.C., who talks frequently with Trump, cautioned that declaration of a national emergency would not necessarily lead to reopening the government.